Atlas Equator Superior review | What Hi-Fi? It's not easy replacing a multiple Award-winning interconnect like the standard Equator, and Atlas hasn't even tried with this higher-priced alternative. Many will be surprised to know the additional £42 buys a new, better quality type of RCA plug and…nothing else. 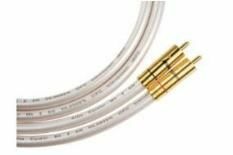 The cable itself remains the same high-purity copper and polyethylene combination as before. Don't believe RCA plugs make much of a difference? Compare this new version to the highly regarded original and you're in for a shock. The new cable retains all the character of the standard version – even-handed tonal balance, subtle yet strong dynamics and fine detail resolution – but gives the listener more in each and every area. Up against equivalently priced alternatives it's the Atlas's unforced, yet lively nature that impresses. This really is a fit-and-forget cable in the very best sense. It just gets on with the job without drawing attention to itself. You can ask for no more in our book. The Atlas's all-round excellence means it's likely to work well in a wide range of systems – something that isn't always true of its rivals. If you're looking for a top-class cable, and don't want to spend more than £100, the Equator Superior is an excellent buy.